Date/Time - 2 and 9 Mar 2018, 9 a.m. – 5.30 p.m. Description - The Word of God brings light and life. When faithfully preached, the Word, like a laser, pierces the soul and spirit. What can we do to sharpen our homiletical skills so that God’s Word can shine more brightly both in our churches and in our society? Come find out at ‘Light of the Word: A Preaching Symposium’! 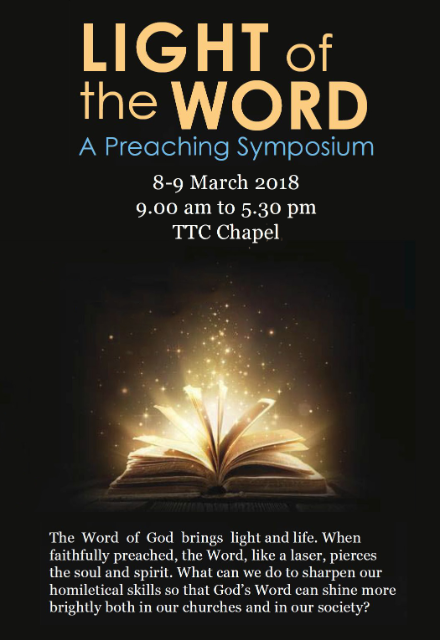 Topics to be explored include the act of preaching in a pluralistic society, the relationship preaching has with church growth, the theology of preaching, and preaching as a form of pastoral care, amongst others. The symposium will also feature workshops on fine-tuning preaching practices, and making it applicable to particular demographics. Time is also allocated for dialogue with a panel of practitioners, and a Q&A session with plenary speakers. Organised by Trinity Theological College. Registration fee: $20 (before 22 Feb); $30 (after 22 Feb). Includes meals and refreshments. To register, visit www.ttc.edu.sg/form-ttc-preaching-symposium-registration. For more info, visit www.ttc.edu.sg/, email info@ttc.edu.sg, or call 6767-6677.